Photo Credit: U.S. Forest Service. 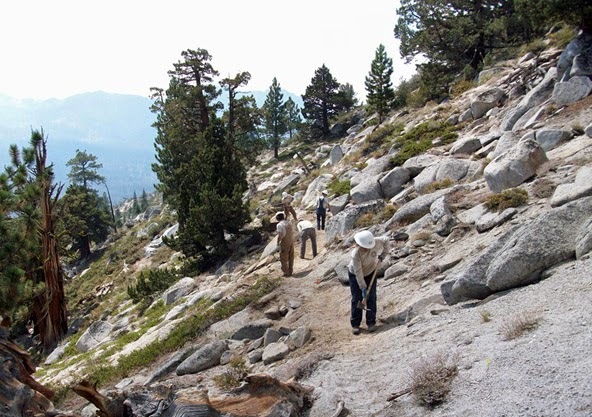 The U.S. Forest Service announced the opening of the new 3 mile Monument Pass Trail in South Lake Tahoe. The Monument Pass Trail connects High Meadows to the Tahoe Rim Trail (TRT) near Monument Peak. The new Monument Pass Trail is a steep singletrack trail on the backside of Heavenly Ski Resort. The trail joins the TRT at the 8,800 foot level. The near-by summit of Monument Peak is just over 10,000 feet. Cheva Gabor with the Lake Tahoe Basin Management Unit told me hikers and bikers can access the new trail from the High Meadows and Cold Creek Trails. Both of these trails begin in the High Meadows housing area off Pioneer Trail. Cold Creek and High Meadows Trails are labeled on Google Maps and Google Earth. For information about the TRT in this area, review the TRT website for the section called Kingsbury South to Big Meadow. Contact Public Affairs, Cheva Gabor (530) 543-2608, or Lisa Herron (530) 543-2815 if you have questions about the Monument Pass Trail or the Forest Service plan to review, design, and construct other trails.